Amphibian embryos are supremely valuable in studies of early vertebrate development because they are large, handle easily, and can be obtained at many interesting stages. And of all the amphibians available for study, the most valuable is Xenopus laevis, which is easy to keep and ovulates at any time of year in response to simple hormone injections. Xenopus embryos have been studied for years but this is a particularly exciting time for the field. Techniques have become available very recently that permit a previously impossible degree of manipulation of gene expression in intact embryos, as well as the ability to visualize the results of such manipulation. As a result, a sophisticated new understanding of Xenopus development has emerged, which ensures the species continued prominent position among the organisms favored for biological investigation. This manual contains a comprehensive collection of protocols for the study of early development in Xenopus embryos. It is written by several of the fields most prominent investigators in the light of the experience they gained as instructors in an intensive laboratory course taught at Cold Spring Harbor Laboratory since 1991. As a result it contains pointers, hints, and other technical knowledge not readily available elsewhere. 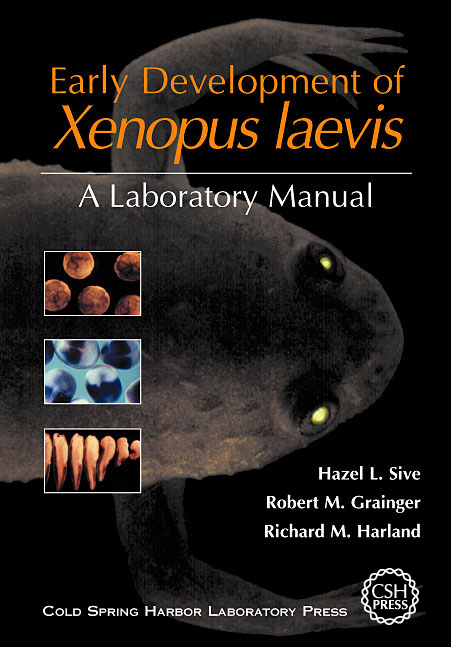 This volume is essential reading for all investigators interested in the developmental and cell biology of Xenopus and vertebrates generally. Many of the techniques described here are illustrated in an accompanying set of videotapes which are cross-referenced to the appropriate section of the manual.